Katelyn Cranston of Umatilla in the center positions herself as a MacHi player brings the ball into the key. 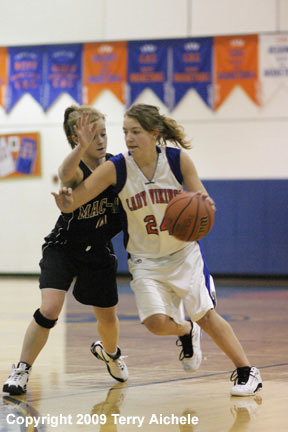 UMATILLA - The Umatilla Lady Vikings dominated the MacHi Pioneers in a non-conference game played Tuesday, January 13, 2009 with a 59-20 win. 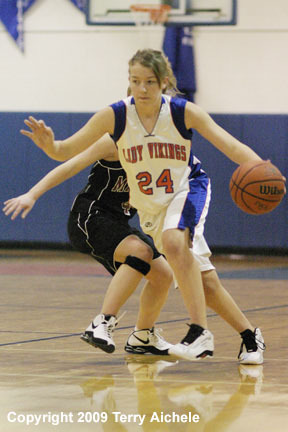 The Lady Vikings dominating play and fast break play left the Pioneers flat footed in their response. 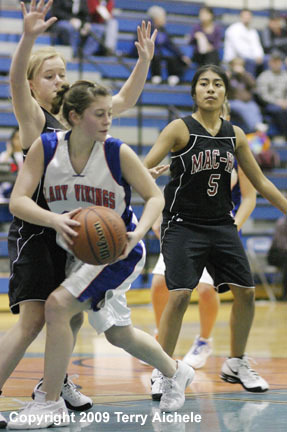 The Vikings held the Pioneers to eight points for about eight minutes of the first half. MacHi were first to score and lead the Vikings until the 5:52 mark of the first period when Umatilla took the 6-5 lead. From that point on the Vikings never looked back. Hot shooters in the first period included Naomi Castanon, Jessica Vandever, and Kassie Kennedy. 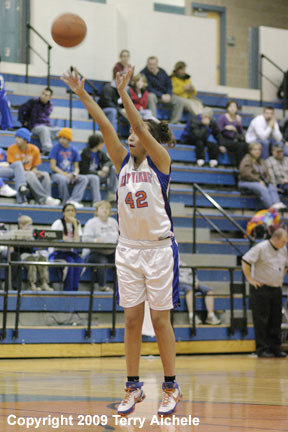 Umatilla held MacHi to eight points from the 4:45 mark while scoring 15 total for the period. Umatilla held MacHi to eight for the first four minutes of the second period. Hot shooters for the Vikings in the second period were Ashley Vandever, Catherine Routson, Kassie Kennedy, Kaitlin Kennedy and Jessica Vandever. Overall the Vikings held the Pioneers to just four points for the second period. The score at halftime had Umatilla ahead 29-12. The Vikings held the Pioneers to just three points in the first seven minutes of the third period. The Pioneers attempted to keep their frustration under control but finally coach Curtis Pumphrey was given a technical with 1:37 to go in the period. The Vikings Naomi Castanon hit one of the two technical foul shots to give Umatilla the 39 to 15 lead. Umatilla layers scoring included Ashley Vandever, Kassie Kennedy, Kaitlin Kennedy and Naomi Castanon. The score at the end of the third had Umatilla ahead 44-17. LEFT - Umatilla's Jessica Vandever, center, looks for an opening or teammate to pass to. 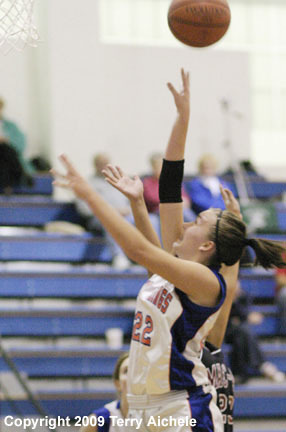 RIGHT - Jessica Vandever of Umatilla drives to the basket for a layup. 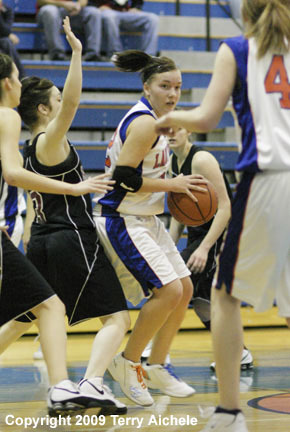 LEFT - Kassie Kennedy of Umatilla drives to the basket. RIGHT - Naomi Castanon of Umatilla shooting one of the technical foul shots following MacHi coach Curtis Pumphrey's infraction. 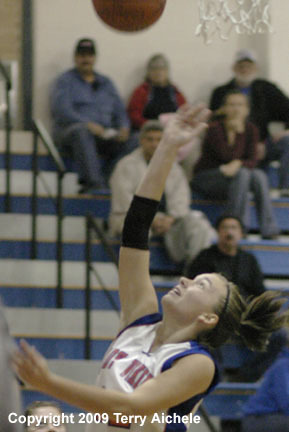 LEFT - Jessica Vandever of Umatilla driving in for a layup. 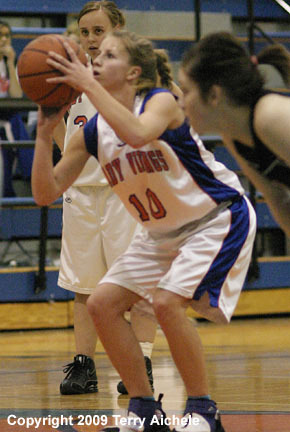 RIGHT - Lindsey Harris of Umatilla prepares to shoot a freethrow.